Yolanda Verberne does not try to hide her surprise. “I don’t know this firm at all. It has never had its headquarters here and I don’t know anyone who represents it here,” says the receptionist at the European Business Center, a glass office complex on the outskirts of Eindhoven, the Netherlands. The contact information for American European News (AE News) appears on the website Aeronet.cz, giving the company address in Eindhoven. But when she sees the web page on her computer screen, Verberne can’t believe it. “It is quite shocking for me,” she says. Although neither Verberne nor anyone else seems to know of the company in the Netherlands, Aeronet.cz is becoming more popular in the Czech Republic. So popular that the Czech government decided to look into it. In its security report for 2014, the Czech domestic intelligence agency BIS named the site as a source of dangerous pro-Russian propaganda. “The primary goal of any power-hungry regime’s propaganda is to drive a wedge, divide and split, slander institutions and governments, create chaos and destabilize,” BIS spokesman Jan Subert said. The Aeronet.cz domain was registered in 2001. The site became active a few months later, initially to serve a different purpose than it does now. Apparently, a non-professional pilot launched the site for other aviation enthusiasts. A statement on the site which is no longer accessible said, “I want to start a public service. I want to start up a server where a pilot can check the terrain and weather of the route before he or she takes off.” This and other deleted parts of the site can be accessed for a fee of $50 paid to the Seattle-based Domain Tools. The name of the site’s founder is no longer traceable. Within a year the site changed focus. The pilots’ debate forum became a platform for illegal downloads of music, films, and software. The Domain Tools archives gives the then-owner of the site as Lukas Brian Ross, of Athens, Georgia. It is possible that Ross bought the site from the amateur “pilot” when he lost interest in the site or simply failed to get it running as he planned. Nothing much happened for a long time. Users continued to post illegal downloads on the site until June 2014, when the site underwent a second radical transformation. Four months after Russia’s annexation of Crimea, Aeronet.cz began posting articles critical of the new Ukrainian government that was determined to fight Russian aggression in Crimea. Aeronet differs from regular news sites that often post links to news agency reports and other source material. As the Echo24.cz website wrote, Aeronet.cz’s information sources cannot be identified or verified and for that reason they can be hardly treated as news. A few pieces appear under the author’s names. “I learned about this website from Facebook. They offer alternative views compared to the mainstream media,” says Petr Cvalin, a member of the Communist Party in Domazlice, western Bohemia. He wrote a piece for Aeronet.cz titled “American and British soldiers are fighting for the Kyiv government.” He claims he used “information from trustworthy sources.” Cvalin communicates with the Aeronet.cz staff strictly via email. “Personally, I haven’t spoken to anyone there,” he adds. The possibility that the site changed ownership last year cannot be checked because of a switch in the site’s domain management. At around the time it began publishing Russian propaganda, it moved its domain registry to a company in the U.S. state of Arizona called Domains by Proxy, which offers its clients an anonymous identity. For a fee of about $10, Domains by Proxy hosts the subscriber’s personal information on a protected server and deals with inquiries on behalf of the subscriber. The people behind Aeronet.cz prefer to stay anonymous. “AE News is an independent Internet news portal run by Czech and Slovak countrymen living in the Netherlands, Russia, and the USA,” the website says. The reality is entirely different, though, and not just because its office cannot be found at its putative Eindhoven address. The same situation occurs in Bratislava, where the parent IP owner of the site is registered. Here too there is no office nor employees. It is impossible to contact anyone at the two telephone numbers – one British and one American – listed on the contacts page. There was no response to repeated telephone calls. However, if you offer to write for the site using the on-site email, a reply comes instantly. “We lead an electronic information war with the enemy that never sleeps. 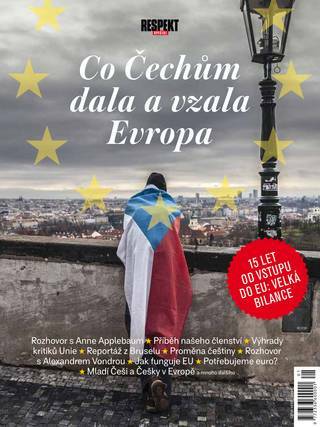 Our enemy is Western media that flood the Czech media platform with pro-American propaganda, pro-American view of the feudal status of Europeans, pro-American interests in the old continent,” VK writes. He regards the Czech public as a manipulated crowd that needs to have its eyes opened. VK says he is a businessman living in Germany. “I travel between Germany, the USA, and the Russian Federation. We have branches in these three countries. My field is mechanical engineering.” He refuses to reveal his identity (he says he and his family moved to Germany a few years ago). “It is nobody’s business,” VK says. His language and style show that he has mastered the Czech language; the articles posted on the site are written in good Czech. Respekt’s sources say the domestic intelligence agency, BIS, handed over only general findings about Aeronet to Czech politicians. They say the agency concluded that Aeronet.cz represents a certain security risk but gave no specific reasons. The sources say American intelligence agencies have shown interest in the site. Late last year Ross, its owner, is said to have been interrogated (it isn’t clear if that is his real name). The Americans wanted to find out who was behind the reports of American participation in the anti-Zeman protests. Websites of the Aeronet type play a key role in the Russian war in Ukraine. The “information war” is “conducted on an unprecedented scale,” writes Anne Applebaum, the American historian and expert on Russia. Pro-Russian portals financed by the Kremlin have mushroomed. They spread confusion trying to influence local politicians’ view of Russia using the local public. In addition to Aeronet.cz, such websites and print media circulating in the Czech Republic include Russian state-owned broadcaster RT (formerly Russia Today) and the magazine Artek, owned by influential cosmetics business owner Alexander Barabanov. “When it concerns the life of relatives in Donbas, attempts by the U.S. and NATO to wage war, genocide of Russians living in eastern Ukraine, and speaking truth, money doesn’t matter,” Barabanov says about the magazine, which received a yearly state subsidy from the Czech Culture Ministry until last year. Artek lost the state financing this year because of its stance on the war in Ukraine. The Czech Foreign Ministry also waded in to this debate, saying public support for foreign propaganda was not in the interests of the state. Disinformation can complicate the jobs of diplomats. Representatives of several allied foreign ministries asked the Czechs for an explanation after Aeronet.cz wrote that the November anti-Zeman protests were organized by the U.S. Embassy. They had heard the story from other, more trustworthy media outlets which ran the Aeronet piece without verifying the sources. The Foreign Ministry had to explain that the story wasn’t true. “I have no time or possibilities to verify sources,” Hasek replies to the question why he posts Aeronet.cz links on his Facebook account. “I share a number of articles from various sources. With respect to the freedom of speech, I am sure you understand there is no problem with that,” Hasek says. The information war complicates the lives of journalists as well. Not only because they could easily use and spread the untrue information themselves. Reporters for Czech public service television are constantly under pressure. The broadcaster’s board receives numerous anonymous complaints about reporters’ critical stance on the war in Ukraine. These same people demand more objective reporting about Putin and his regime. Email accounts of reporters and their bosses are regularly trolled with similar complaints. Czech public TV has not allowed itself to be influenced by this phenomenon so far, judging from the lack of any analysis of its broadcasts indicating unbalanced reporting about Ukraine. Journalists in most European countries face similar attacks. British media outlets are often flooded with hundreds of pro-Kremlin voices that stand out from most other forum contributors. Western intelligence agencies surmise that these attacks often come directly from Russia. Moreover, secret services are said to have faced a number of hackers’ attacks last year. In their discussions on further sanctions on Russia, European Union leaders have authorized Federica Mogherini, the high representative for foreign affairs and security policy, to draw up a plan to stop the propaganda. Mogherini is to announce details of the plan soon.